Baby Size: A papaya! Mmm… papaya. She’s about 1 pound now, and 11 inches long! Symptoms: Still officially in the sweet spot and enjoying this time while it lasts! 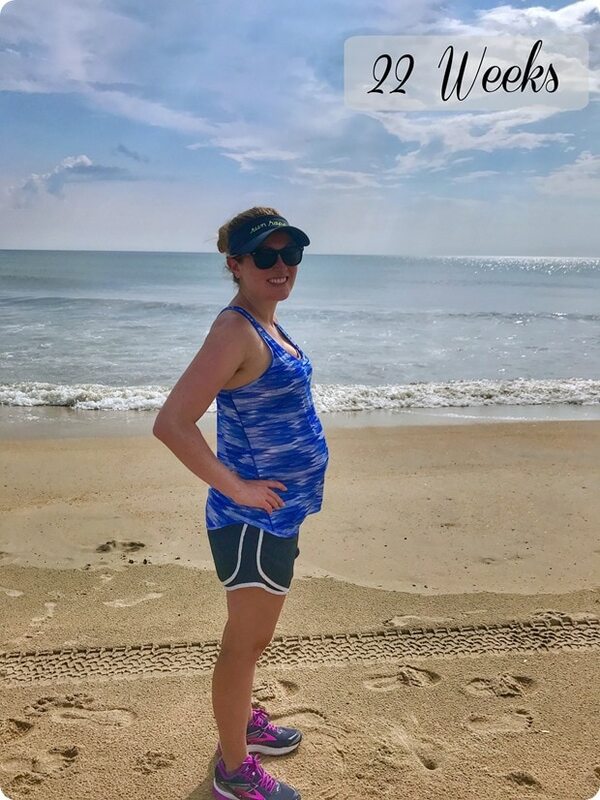 Feeling normal besides just slower/less nimble, although putting on shoes is starting to get more awkward… (I know, you guys are like, that’s hilarious, wait until you are 38 weeks and trying to put on your shoes)! I have also randomly been getting some nosebleeds in the morning though – just my left nostril, and it doesn’t last long. It’s generally only if I make the mistake of blowing my nose. Ah, pregnancy. Fun times! Currently Missing: Cool weather – it’s sooooo hot right now. In the high 90’s but “feels like” over 100 with the humidity. Brutal for everyone, but especially brutal when pregnant! Dog walks have had to happen early and late – no more midday adventures for now! Sleep: Still a bit restless, mostly due to getting the dogs settled and into a routine. I also always wake up once to go to the bathroom and sometimes have a hard time falling back asleep after that. Cravings and favorite foods: Still really into juicy stuff – coconut water, fruit, yogurt, smoothies, raw veggies like peppers, cucumber, etc. Hummus + pretzel crisps and I are also having a serious moment. The baby is basically 50% hummus at this point… and after writing that I’m really craving hummus now. I’m happy to report that I’m feeling pretty much normal now though in terms of food, in the sense that I mostly enjoy dinners again/don’t find food in the evenings totally off-putting. This is super exciting, and also means I can actually cook dinner again without wanting to throw up, which is good news for Matt! Food aversions: I don’t really have any right now. Hizzah! (crosses fingers I don’t jinx myself.) Super heavy/fancy food is still not my fave, but in general nothing is crazy nauseating anymore. 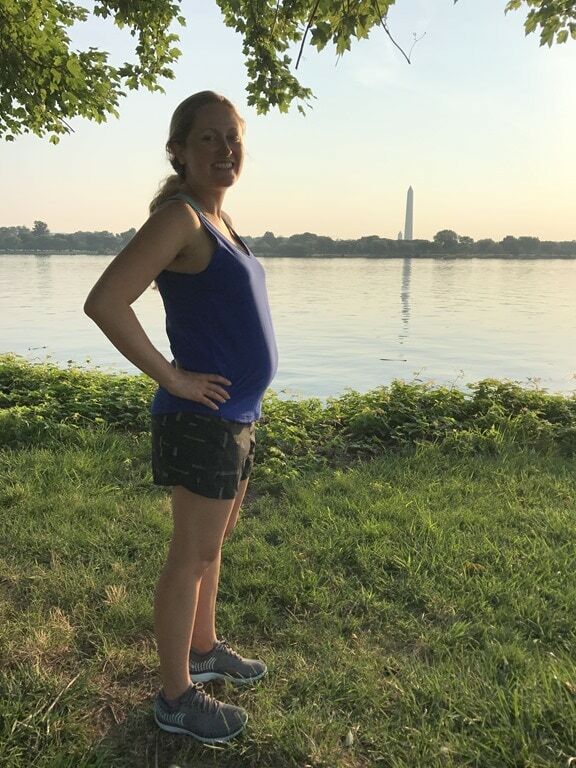 Exercise: As I mentioned yesterday in my “thoughts on running and pregnancy” post (thank you for all your kind and helpful comments on that post! ), running just doesn’t feel great right now between the heat and the pounding on my bladder/pelvis, so my cardio has been walking and hiking! 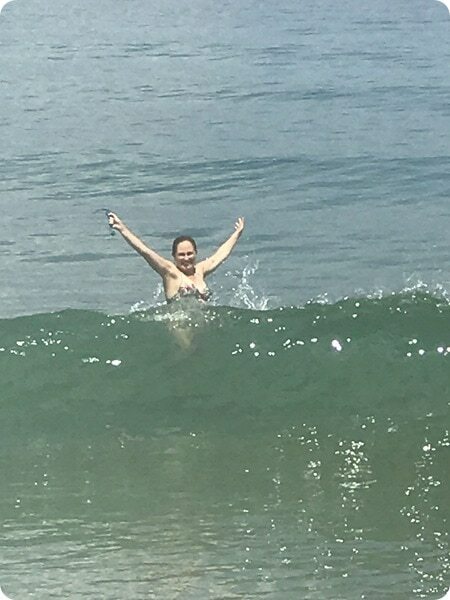 Basically, I’m getting in some sort of movement pretty much every day of the week – generally a few classes (boot camp or yoga) each week plus lots of walking and the occasional swim. It keeps me feeling good physically and mentally so I’ll keep it up as long as it feels good! I’m definitely modifying more in classes now, though (especially jumping moves in boot camp classes – no bueno), and keeping the pace slower! I’m also officially feeling the baby move around now which is both super cool and super weird. It’s still not visible from the outside yet, but I’m hoping it is soon so Matt can join in on the experience! Maternity clothes: I got a ton of hand me down maternity clothes from my friend Jess and my sister-in-law (also named Jess! ), so I’m pretty set now with warm weather maternity clothes. I still need more workout shorts and more workout pants, though… that will happen soon. The dress below is a hand me down from Old Navy! Reading: I just ordered Bringing Up Bebe which I’ve heard good things about. Any other recs for realistic, practical, and not insanely long/overwhelming parenting books? I’m also planning to do a little reading on the delivery/labor process so I know what to expect, and Matt and I are going to sign up for some prenatal classes at our hospital, too, so I’m sure those will help. In related news, I’m looking into potentially getting a doula after rave reviews from friends who have used doulas. I don’t know what approach I want to take with the delivery (aka epidural or not – I’ll probably just go into it with an open mind since I know it’s hard to plan for something you have no clue about/haven’t done before), but I figure having a coach on board to support us throughout the process either way is not a bad idea, right? For those of you who had doulas – are they mostly recommended for non-epidural births, or can they be for anyone? Was it worth the money? I’d love recs for doulas from those of you that are local that had a good experience with one, too! Buying: After reading my friend Kylie’s recent pregnancy update post I took her lead and applied to order a breast pump through Aeroflow. You put in your insurance info and they let you know what pumps you’re approved for (both free and “upgrade” options); you can order the pump directly though them, too. Thanks for the tip, Kylie! What breast pump do you guys recommend?! It seems there are a ton of options that I’m approved for and I have no idea what’s best. I am planning on breastfeeding if I’m able to, but I’m sure having a pump on hand will be really helpful for when I start thinking about getting back to work outside of the home – and for others to be able to feed the baby using a bottle on occasion. Excited for: In a few weeks we are going to start planning out the baby’s room and reorganizing everything. It will be a lot of work to get everything moved around and set up (we need to get rid of a bunch of stuff in the process), but I’m excited to see it all come together! I’ll share updates as we get moving on this. :) Basically, we’re going to swap out our guest room bed for a pull out couch (or futon maybe for now), and move Matt’s guitar/dude room down to the former guest room. His previous dude room/office, which is upstairs across the hall from where our bedroom is, will be the baby’s room. Thank you for reading and sharing in this special time with me! My next update will be at 24 weeks. Until then! Happiest Baby on the the Block! It SAVED me during the first growth spurt. It also helped me break unrealistic expectations about how my baby should behave. They’re babies, they don’t necessarily want to follow a schedule. Not long after implementing the 5s method from this book, she started sleeping through the night! As far as breast pump goes, I have a basic Medela, I like it fine, can’t go wrong with Medela! I was just looking into that book – glad to hear it’s a good one! I could not agree more with reading that book. I read it 6 weeks after having my first son and it explained so much and seriously changed how well he slept. I have a Medela PISA which is a pretty common one. I have no basis for comparison, but it does the job and the fact that it’s so widely used is good because you can run to Target or even CVS to get replacement parts if needed, as opposed to ordering them online and having to wait for them to arrive. Looking good, Mama! I had an Ameda Purely Yours pump with my first, and it was good. But with my second I got the Medela Freestyle and it was awesome. It is probably an upgrade option, but worth it. Get a Spectra if you can, way way better than Medela. The suction is more akin to an actual baby and way less painful. I wish someone had recommended it to me when I was pregnant but you will here majority Medela because it’s the biggest company/most easily available. In my opinion, the only plus side to the medela pumps is that you can easily get extra parts at places like Target but Amazon can help with any extra Spectra parts you may need down the road. I have a Spectra S1 and HIGHLY recommend it!! It’s more efficient and quieter than the Medela PISA, and it can run on battery power, so I can literally use it anywhere! Also re doulas, I didn’t bother with one. It wasn’t worth the expense to me. My nurses were amazing – I had planned to go med-free but ended up needing pitocin (and opted for an epidural at that point since pit contractions can be super painful! ), and they walked me through every step of the labor and delivery process. And I work in the medical field, so I’m comfortable advocating for myself and understanding procedures. If you’re not, then a doula might be beneficial to you! The early flutters of movement are so cool! It’s a kind of secret bond just between you and baby. Oh, and I was pg at this time last year (also about 20 weeks along) and I think I stopped running in like May, outside of WODs. It was just too hot for me to be comfortable or safe. Love hearing the updates, keep them coming! So excited for you guys! Thank you for the tips, Katy! I love my Medea Freestyle! I’ve had it since my first daughter was born in 2011 and it’s still going strong (I have a 9 mo old). I also have the Medela Pump in Style (was free for my last baby w insurance). I’ve use daily the PIS and it works well too, but in opinion the freestyle is totally worth the upgrade!! You can truly be hands free w the Freestyle and walk around, do chores, get ready, etc. I realize this may sound weird now…but multi-tasking as a young busy mom is key! I had a doula and 100% plan on hiring her again for my 2nd. My dr was surprised when I said I had one since he knew I wanted an epidural, but I wanted someone to be there who was on my side and knew what was going on. My husband also travels for work every Mon-Thurs so my initial thought was that I needed someone there in case he wasn’t around when I went into labor. Thankfully we did not run into that problem, but my doula was worth every penny! The easiest way to describe her is like a day of wedding coordinator. Someone who takes care of everything and ensures things are running smoothly so you can just enjoy the process. My husband and I aren’t the type to speak up so it was great to have her around to ask questions to and she would interact with the nurses when needed and always made sure they were staying in line with my birth plan. Also, the hospital was really busy that night and when we were discharged, the nurse told me how great our doula was and how helpful she was to them since they knew they could rely on her with so much going on in other rooms. Plus it was just really comforting to have someone so experienced right there with me through it all. Truly whatever you want from them, you just need to let them know and they’ll be there for you. Whether it’s assisting you to have a natural birth or just being a source of comfort and support, that’s what they’re for. Also, I’m local and my doula was Kerry Schultz https://www.birthinbloom.com/. Highly recommend her! I’m also on the spectra train. I have a medela too and the spectra is so much better in my opinion. Get the one with the built in battery since it’s so nice to be able to carry it around the house and multitask or use it on a plane, car, etc. I would highly recommend a doula for any type of birth. You may find some doulas that focus on or advocate for nonmedicated birth, but there are many that work with all types of labors. Just make sure you discuss this during the interview process, and make sure you’re all on the same page. Hilariously enough, my doula wasn’t even able to be present at my birth (my entire labor ended up lasting about 2.5 hours, and I had to call an ambulance to take me to hospital because I was about to have a baby alone on my bathroom floor) but all of the meetings we had beforehand made me feel so calm and empowered to handle what turned out to be an emergency-type situation that I had to cope with mostly on my own. It also made my husband feel a lot more confident, because he knew he wouldn’t have to be solely responsible for soothing me, making medical decisions, etc. Doulas are great at coaching partners, too! I’ve heard doulas are amazing for partners in particular – I’m glad you had such a good experience despite her missing the actual labor, ha! That’s insane it was so quick!! I have never been pregnant yet, but I have found the thought of using a doula. Sry comforting. I just feel like the care will be more individualized and I have heard a lot of horror stories about how birthing plans go out the window meow in hospitals. I feel like hospitals are there to save lives, but also prioritize time, money and resources. I’m not always convinced they have the patient’s wants/needs in mind. Yeah, I agree. I also just feel like all the doctors we’ve met so far (we go to a practice with a bunch of docs you rotate through) are perfectly nice and I’m sure really good at their jobs, but they spend like 2 minutes with us and I don’t want to feel super clueless and out of the loop on the big day. I had two natural births and opted not to have a doula (after strongly considering it the first time around). I won’t comment on having one since I can’t speak from firsthand experience, BUT, I do think you should consider how private a person you are. Looking back, I’m grateful to have the experiences for just my husband and I! That said, make sure he can be strong for you (or fake it if he’s scared😂)! Whatever you decide will absolutely be perfect for you! Thank you Laura! I think I need to meet a few doulas to see if I find one I really resonate with, and then go from there! I love the Spectra 2 pump that I used! My baby girl is 11 months and I almost made it to a year breastfeeding and pumping! It’s very overwhelming at first but it gets easier and just becomes a part of life. I also had a very strong appetite while nursing- nothing that I had in the past (having to eat 3+ lunches) but it’s crucial to eat to maintain supply. I can’t wait to follow you on your journey! Get a doula! I had one with both my births (one without pain meds, one with an epiduarla) and she was super helpful with both! Well worth the money for their knowledge and support. Mine also checked up one is after we had had been home for a few days. The doula with my first birth did a private pre natal class with us so it as nice not to have to spend a bunch of evenings at the hospital. “Wonder Weeks” is really cool for after baby is born! “The Happiest Baby on the Block” sleep book was also good. Other than that, I didn’t find many books terribly useful, although a lot of friends found “Baby 411” to be helpful. Try the library first and see if you like the style before you buy. I had a doula and she was so helpful. She came to my house before labor, and was so supportive as I threw up in the bathroom. My mother and spouse were both eee, but as sympathetic pukers, they were not going to help for that part! She was wonderful during labor and delivery, too – our nurses were great but during shift change it was nice to have one person hang out and communicate our needs. She also brought us food and milkshakes post-delivery, which was so great! A doula isn’t a necessity, but I really appreciated the extra help. I also had a Hygeia pump, and it was fine. Pumping is no fun no matter what, and it mostly seems like the pumps are roughly equivalent. Yeah, I really like the idea of having one person there the whole time who is just there for us, and not potentially leaving/changing shifts! The book is controversial but I found Baby Wise to be the method that worked for me. I think schedules and routines are so important for both parents and babies. I need a schedule and predictability to function well. I’m also a working mom so I couldn’t just follow the baby’s lead. I had to teach my boys the routine. My first baby thrived on it. My second had really awful reflux and never slept more than 45 min at a time. I always followed the basic routine though. Wake, eat, play, sleep. Look into the Wonder Weeks. That was very helpful. I had an epidural with both deliveries. I didn’t have a doula and wouldn’t change that. It was only my husband and I in the room. I’ll check out those books, thank you! Just want to say that I love your site! Big fan of yours in Alexandria :) Also wanted to mention you might want to keep any birth plans as very flexible. I had a completely normal pregnancy and ended up having my water break and giving birth 7 weeks early…the doctors don’t know why (I have a happy, healthy 2 year old now). That was not part of my “plan”! Also, if you end up needing a c-section or are planning on doing a natural birth and then decide you DO want painkillers of some sort, you can head of a lot of feelings of guilt that no new mommas need! Something to think about. I highly recommend the free breast feeding classes at the Greater Washington Breastfeeding Center, on K st I believe. I’ve been hearing great things about that place! Thanks for another informative update! I loved my Spectra and everyone I know that had the Medela first preferred the Spectra too. More powerful and gentler. I agree with Jordan on the books—I read a ton and stressed myself out and most weren’t applicable to my son once he got here. He hated, hated, hated being swaddled but I read in Happiest Baby on the Block that all babies love being swaddled so I thought I was doing something wrong. Turns out all he wanted was to be in the Baby Bjorn carrier when he was fussy. Same thing with sleep training books—I read about 4 and agonized over what plan to use and we ended up not using any. Don’t add any more stress or feel like you have to learn a bunch of stuff because you will figure it out as you go!! first, congrats! i just had a baby at the end of march and life is so wonderfully different now! i would recommend the Medela InStyle pump – its very popular for good reason and covered by most insurance plans. It’s a dual pump so you can do both sides at once to save time and its super easy to use. 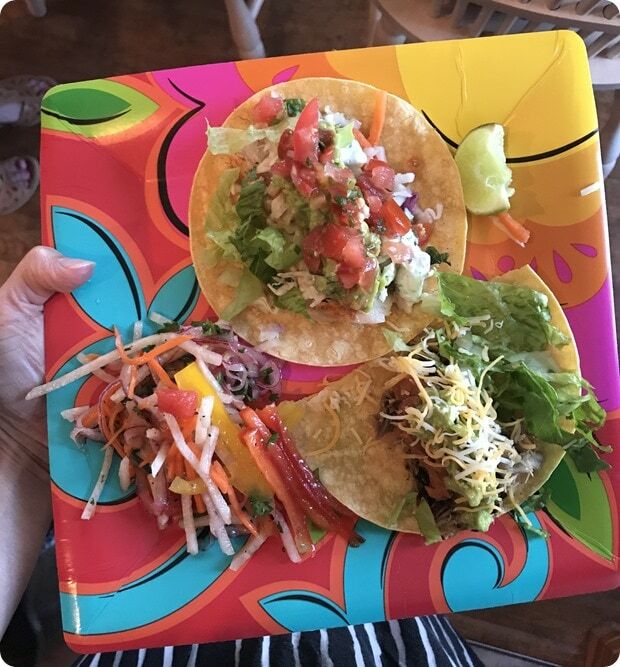 you will want it even before you go back to work so you can pump in between feedings to build up a little freezer stockpile, or to make sure you have an emergency bottle on hand just in case you happen to be away and your husband or caregiver needs to feed baby without you. as for the doula, i think its a great idea if you can afford it. the biggest things they will help you with are labor decisions (if/when to take meds, positions to try during contractions, should baby get vitamin k? hep b shots? etc.) some even take pictures of the birth, which is priceless. we ultimately decided to use one so that my husband could just “enjoy” the birth and be present with me instead of worrying about every detail since he was also under a lot of stress and unsure of things. for us it ended up being a slight waste to use a doula because my baby came SUPER fast and super painfully so none of the techniques we discussed really worked! that is the most important thing you can know ahead of time – there is no amount of work or knowledge ahead of time that can truly prepare you for what will happen during your birth. you have to come armed with whatever will make you feel comfortable and know your story will be totally unique! good luck! Like others above, I LOVE my Spectra S2. And when it began to slow down after about 6 months of use, they sent me a brand new one after very minimal paperwork. They did want the document showing that I owned it, though — something to keep in mind when yours arrives. The Birth Partner is a book I found very helpful in explaining what to expect during birth and options for responding to it, with medical and non-medical interventions. It’s a great one for Matt to read, too, though I think a good doula will also see her job as helping your partner to support you and feel engaged in the birth process. The Birthful Podcast has some good episodes, though I only listened to the ones that interested me. Lucie’s List has great reviews of baby gear. I also second the Wonder Weeks app when baby arrives. I love baths, so I like this advice, ha! I’ve heard so many people say a doula is especially helpful for the partner, so they know how to be helpful and are given a job/something to do! :) Definitely going to interview around… such an intense and person experience definitely calls for making sure you really vibe with the person! I’ve used the Medela PISA and ended up with the Symphony (hospital grade rented pump) for my second kid. I would either try a Spectra pump or rent a Symphony for the entire time if I have another kid. Many insurances will cover the pump rental. I def recommend reading the Nursing Mother’s Companion or another breastfeeding book. The lactation consultant in the hospital was helpful, but I liked that I had some knowledge before my first was born. Also, Happiest Baby on the Block is available as a DVD. My husband never would have read the book, but he was fine watching the DVD!!! You can google it and find Dr. Karp demonstrating the 5 S’s on youtube too. Omg there’s a DVD? That’s WAY easier for us to just watch it together. Great tip – thank you! I knew I was planning on an epidural (best thing everrrr haha) so I didn’t see the point in paying someone to help get me through it—labor and delivery nurses in my experience are amazing and can give you great coaching! I didn’t know what the heck I was doing in terms of pushing and they were fantastic. However, even with a natural birth I wouldn’t have hired one because I’m very private and only wanted my husband in the room (and I made him stand by my head! ;)). I would agree with others that the Medela Pump in Style Advanced is a great pump. I ended up exclusively pumping so I was attached to that thing a LOT. :) It held up great. Yeah Matt is definitely standing by my head, ha! Happiest Baby on the Block, Moms on Call and Bringing Up Bebe were what we read and loved. Most of them are available for inexpensive on Amazon or at the library! I had an amazing pregnancy with hopes of doing the all natural thing and yet…baby was faced the wrong way, I had the world’s worst back labour, got an epidural, then ended up with a c-section because the baby couldn’t get past my pubic bone and my placenta was abrupted. All to say, read up on c-sections because I didn’t bother and I regretted it. Definitely going to – and going to go in with an open mind because I don’t want to feel guilty/disappointed by setting certain expectations. Who knows how things will go – I’ll go with the flow! Rarely post but think you’re brilliant! We rented a medala hospital grade. Less portable but much more effective. The book by finding Dutchland bloggers, maybe it’s happiest baby in the world, is great. So is their blog! Last, if you haven’t been yet you’d love Journeyoga’s prenatal classes. Yoga -Bootcamp, in one, especially when Padma is teaching but the other teachers are great too, and Tranquil Space has an amazing prenatal workshop for pregnant people and partners. I’m not sure how their prenatal classes are since DuPont was a little inconvenient for every week, but I’ve heard good things. Am a frequent reader of your blog and quite possibly the only dude to respond to this post. Re books: Have not read this one, but have heard good things from friends. Its basically a myth busting book written by an academic in response to all the conflicting advice she received while pregnant. Re feeling hot: We had/have similar weather here (MN) and outdoor bootcamps became unbearable for me. I came across this post: http://behappyhealthyhuman.com/happyhealthyhuman/quick-cooling-cucumber-soup-recipe/. Her argument is that one needs to hydrate intelligently i.e. eat stuff that naturally cools you down (from the inside) rather than drink tons of water/eat stuff that heats you up. Re trouble falling asleep: I have the same problem: hyper active brain+tired body=no sleep. Here is post that shows yoga poses for relaxation: https://www.acefitness.org/blog/5782/5-yoga-poses-to-do-before-you-go-to-sleep. but a general relaxation technique is to focus on ones breathing (i.e. breathe from your stomach rather than lungs). The other thing that works for me is to start thinking of a really hard research question (am an academic). Ironically, it shuts off my brain instantaneously. You could also try guided meditation apps. I’ve been meditating for more than 10 years now (using an Indian one), and it really calms you down – mental garbage from the day gets erased and body temperature goes back to normal. Also, there might be yoga classes for pregnant women – I remember seeing a “Yoga for Pregnancy” class at the local studio here. Thank you Puneet! I read “Expecting Better” in my first trimester and it was excellent – the best pregnancy book I’ve read, hands down! Appreciate the other tips, too! Skip the doula and spend the money on a postpartum massage and/or large tub of ice cream. You can do it solo! Just be clear at the hospital about what you want and make sure the nurses are on your side. Medela double pump in style is the way to go, and but a hands free pumping bra (or cut slots into an old sports bra). Lol to the large tub of ice cream! I’m definitely getting a postpartum massage… being able to lie on my stomach again for a massage is going to be awesome! I loved Bringing Up Bebe! I read it when my daughter was about 9 months old and I feel like it helped me relax a ton. I also liked that it read more like a novel than a parenting book. I also read Healthy Sleep, Happy Child. I think this book stressed me out more than anything. I would go crazy trying to get her to sleep at a certain time. After a while, I realized that she is a good sleeper no matter what and keeping her on such a strict schedule wasn’t necessary. I was open-minded about delivery, but wanted to do it natural. I tried hypnobirthing. You basically listen to mp3’s for weeks prior and it is supposed to help you relax and have a natural birth. Ha! No amount of relaxing and meditating was going to get me through the contractions. After 7 hours of laboring at home, I decided I had enough and went to the hospital for an epidural. After that, it was smooth sailing! One thing I didn’t know was how long you have to push for. All of my friends pushed a couple of times and the baby came out right away. I pushed for 2 hours! I’m most likely going to be on team epidural, too… I feel like there’s no need to be a hero, you know?! We’ll see! Have to say I don’t have any book recommendations since my kids didn’t fit into any mold – my first didn’t sleep thru the night till 13 months. And my 2nd was sleeping thru the night at 5/6 months. So most important I learned the hard way that all babies are different. Also I live in Arlington too and delivered both times at VA Hospital Center. Not sure which hospital your OB is affiliated with but just FYI. I had a great experience both times at that hospital. My husband and I had our first child in May. We are both really private people so we opted to take a husband (or partner) coached birthing class together (Bradley method). While some of the aspects of the Bradley method are a bit out of date and it is geared towards having an unmediated labor and delivery I was so glad that my husband was so knowledgeable and involved in the process. He was the best coach, support and advocate for me because he knows me so well and can stay calm and rational in stressful situations. Best of luck with your pregnancy and delivery! I did not have an epidural for either of my kids’ births and I am not sure I really recommend that. My son was 9.5 lbs and my daughter was 8lb 13oz. You can go in and decide what you want as you progress. Just don’t wait to long. I had the most wonderful Doula for the second birth and it was great having someone with you all the time and very comforting. I did Bradley classes and they are fine but it was having the doula there that really helped me relax. I delivered at Arlington Hospital and having her there was NBD. She also took pictures right after the birth and I love them. That’s really good to hear about the doula – thank you for sharing! I’m interviewing a couple doulas today… we’ll see if any of them feel like a good fit! As far as books I really liked Happiest Baby on the Block as I saw someone else recommended – we also got the DVD as a gift and that was great (only an hour long) to watch with my husband and see the tips in action! 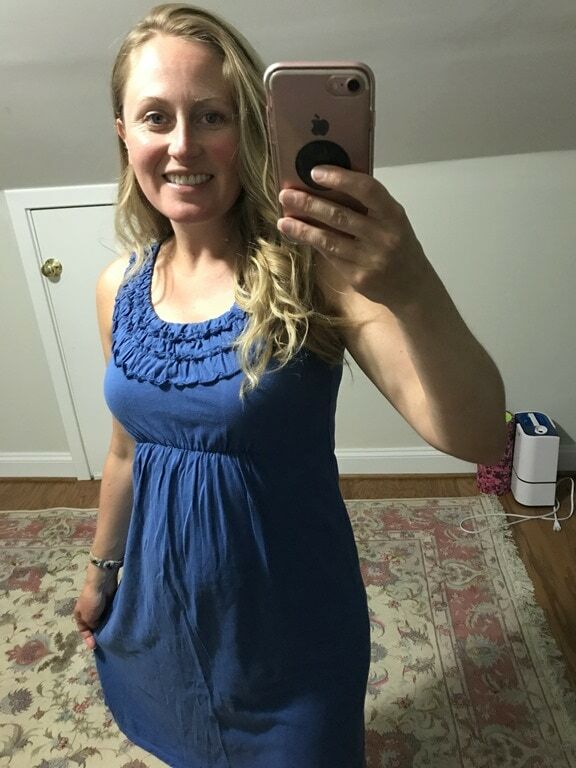 I also enjoyed Panic Free Pregnancy (recommended by Julie from Peanut Butter Fingers, I think) to give me some good perspective on things :) I am delivering at Fairfax Inova but live closer to VHC so I took a breastfeeding class there and would highly recommend it! The instructor of the class also runs the free breast feeding support group at the hospital that meets weekly so I thought it was a good opportunity to meet her. Good to see all of the videos and get some tips on what to expect :) So excited for you!! Good luck! Awesome, that’s good to know about the breastfeeding class! Thank you! And yeah I love the idea of the DVD version of Happiest Baby on the Block – will be easy for us to just watch together and be on the same page. :) I’ll check out Panic Free Pregnancy, too! Wonder Weeks is awesome and so insightful. It makes you realize you’re not going crazy! Get the app, too. We also really like Pamela Leach “Your Baby and Child” and still use it at 15 months. Warning re: Happiest Baby and other sleep books… we had a really hard time getting our daughter to sleep, namely naps during the day. I found that a lot of sleep books made me really frustrated and I had to put them away. There are a couple of good techniques and it’s worth a read, but don’t get too caught up if certain books don’t work for you! I used a Medela pump and liked it well enough, but it sounds like next time a Spectrum is worth a try! I also probably should have taken a breastfeeding class beforehand. Even more important is to have help lined up (like the support group Rebecca mentioned) so you have somebody to turn to if things aren’t working out. We ended up making it a year, but the first month or so was really tough and support is necessary! I had a doula and planned on an unmedicated birth. After about 15 hours of labor starting at midnight I was just so exhausted, so I tried nitrous oxide to take the edge off, but it did not work at all for me. I gave into the epidural and have zero regrets. My doula supports all types of birth and helped me navigate the decision to get the epidural. She also massaged me through contractions (trading off with my husband), which was worth every penny. Overall, even with a great doctor (mine is amazing!) it is nice having a guide with you and took a lot of the pressure off my husband, too. It’s also worth looking into a postpartum doula, or working something out with yours to have some after-birth care at home. I wish I had done that and plan to look into it next time. Thank you for the tips, I appreciate it! That’s good advice to read up on some of the stuff beforehand, but to not stress if it doesn’t work for us/our child, either. I think this will definitely be a “go with the flow” sort of experience! I liked Bringing up Bebe, it had some interesting ideas and was a much more fun read than most parenting books. Right now I’m reading Your Self-confident Baby by Magda Gerber and love it! I have been using my Medela pump since my first baby in 2014 and it’s still going strong. The owner of Blue Nectar Yoga Studio, Jane is a doula. Oh neat, I didn’t realize that! I love that studio – was planning to start hitting up their prenatal yoga classes! I’m sure you will really enjoy their classes! If Jane can’t help you, hopefully she can give you other recommendations.